There’s usually two ways I organize these dinner interviews. Either I think of someone who’d be interesting to meet, or strangers email me asking to take part. A few weeks ago, I opted for a third way. 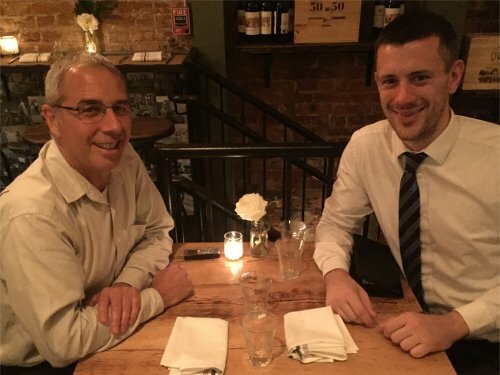 David Stivaletta, an accountant living in Washington, DC, won a dinner interview as part of a silent auction to raise funds for college scholarships for nine young LGBT athletes in the city. I offered the dinner as an auction prize assuming it would receive a total of zero bids. But to my delight, people did actually bid on it. And David won. That’s how we ended up meeting at Lupo Verde on the 14th Street corridor, a neighborhood that used to be a red light district and open air drug market where half the buildings were abandoned. It’s had a massive overhaul in recent years and is now peppered with upscale restaurants and fashionable boutiques. 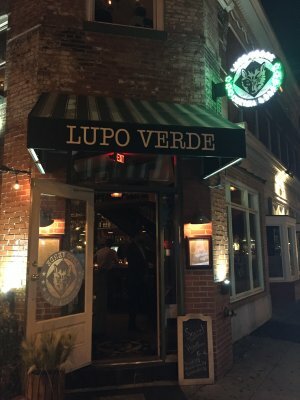 Among the renaissance of upscale restaurants is Lupo Verde, an Italian place that makes its pasta in-house. David recommended it as he’s enjoyed brunch and dinner there before. While we perused the menu, I asked David what inspired him to bid on dinner during the auction held by Team DC, which organized the event. “It seemed like a fun way to meet a new person and maybe you could get to learn something about me,” he said with a smile. What I learned during our meal is that David’s a great conversationalist, a laid-back man with an interesting past, and a fun dining companion. David is currently controller at Capitol Seniors Housing, which provides housing for independent and assisted living for the elderly. But his past includes time working in hotel kitchens and his present includes renovating properties in DC. 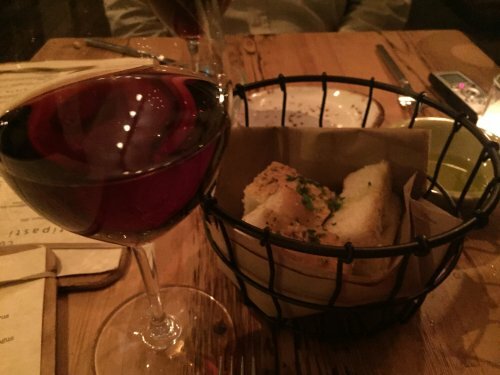 While we sipped on glasses of pinot noir and enjoyed a basket of freshly made bread with some olive oil, David told me about his childhood. He was born and raised in Baltimore, a middle child with two sisters. His father was an immigrant to the States from Italy who met his wife soon after arriving here. They married and settled in Dundalk, which is part of Baltimore County. “It was pretty typical” growing up there, David said. He went to high school in the area and worked his way up through the Boy Scouts of America, becoming an Eagle Scout. After he turned 18 he stayed with his local troop and became a leader, and eventually treasurer on the Scouts’ council. But David, who is gay, quit once the Scouts announced they would not allow openly gay members. “I was happy to resign,” he said. While he was in high school, David worked as a busboy at a restaurant. On Saturdays the chefs would show him how to cook, and he was hooked on it. So David decided to indulge that passion by going to culinary school in Baltimore. He used the skills from that training to work as a saucier at the Hyatt Regency in the city, making all the soups and sauces for the hotel. “It was a lot of fun,” he said, recalling some of the exciting events that he helped prepare meals. For example, in 1980 the Republican National Convention took place at the venue and Ronald Reagan was in attendance, so secret service agents swarmed the hotel kitchen, and the pressure was on all the chefs. It was a lot less frantic at Lupo Verde, where conversation was easy thanks to the low ambient noise levels. The service was also perfect. We had a friendly and informed waitress, and she returned to our table to present our shared starter. 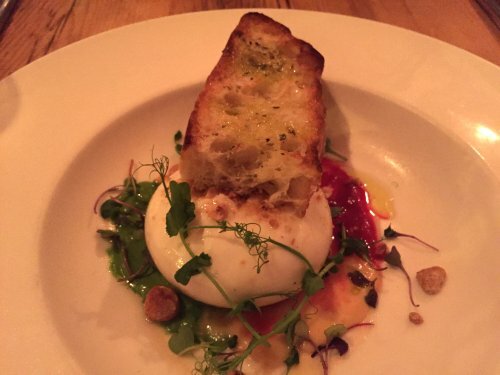 We split a plate of burrata cheese, red and gold beets, parsley sauce, poppy seeds, toasted bread, honey and roasted hazelnut. It was a large dollop of cheese, more than enough for sharing. And, as with all the food that night, it was delicious. the ingredients fresh and high quality, a subtle sweet flavor to the dish that meant we finished it off quickly. Although David loved to cook for a living — and still does as a hobby — he realized that the high-stress nature of the job would not make for a good lifelong profession. So in 1987 he quit the culinary life and went to college full-time. At Loyola University, David switched from cooking to counting with a degree in accounting. “It was a left brain, right brain change,” he said. The course taught him about applying accounting theories, understanding tax law and more. After graduating he found work quickly with a small public accounting firm in Baltimore, following by a stint working as the controller for a regional hotel group in the area. “I was still accounting but I was also able to use the skills that I had learned from working in the hospitality industry” when he was with the Hyatt, David said. Eventually the lure of a more exciting life called and he started to look at bigger cities. The District made the most sense because it was a metropolis that was not too far from his family in Baltimore, and also less intense than New York City. “I wanted a little more upward mobility,” he said. 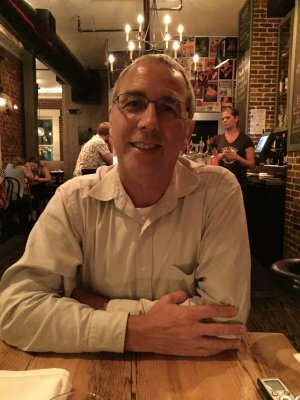 David picked up a copy of the Washington Post one weekend, faxed his resume to a headhunter, came down to interview for jobs the next week and soon had three offers of work. Before he could continue with his story, our waitress arrived with our entrees. 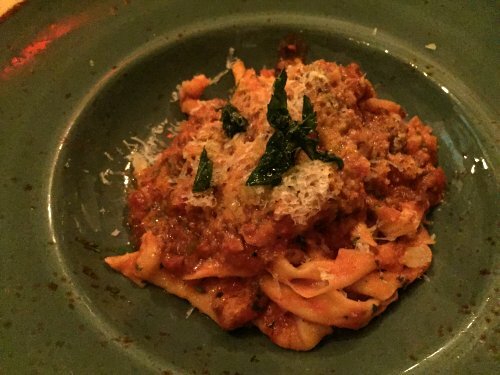 We both ordered the homemade fusilli pasta served with a neapolitan ragu, pecorino, romano, and pine nuts. Everything about this course was flawless, from the hearty ragu with its hint of red wine to the crunchy pine nuts and the perfect sprinkling of cheese. I’d order it again. From 2000 to 2005, David managed entity accounting for Marriott International, again maintaining his ties to the hotel industry. And he’s had a steady stream of work ever since for several firms, most recently his current role at Capitol Seniors Housing. Housing is not only a professional interest for David, but also a personal one. Pointing out the window from our second-floor table at Lupo Verde, David remarked on how 14th Street outside had been a run down neighborhood years ago. But the investment made in real estate has revamped its fortunes, he said, with restaurants like the one at which we were dining. That’s when our dessert of tortino alla nocciola arrived. 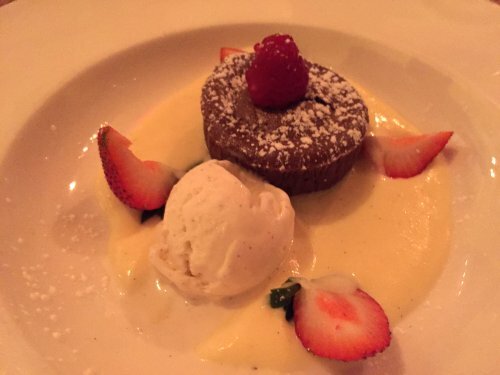 It’s a hazelnut and chocolate cake served chantilly cream. It was incredibly rich, with David only able to manage a couple of bites. Fortunately, I am blessed/cursed with a sweet tooth, so I had the rest of it. While I polished off the dessert, David told me that he previously invested in a project to improve a 19-unit apartment building in the city’s Southeast quadrant. As part of the renovation they set up an after-school program teaching children how to use the internet. They convinced the city to clean up the lot behind the property and turn it into a playground. And the investors worked with the local church to encourage long-time residents to move in to the place. Locals signed up for the building, and soon the adjacent and neighboring properties were revamped. “We changed an entire block in DC,” he said. “You can rebuild with having a community vision toward improving the lives of people living in those communities. That’s just a great thing. David told me that when he’s not working or renovating properties, he enjoys traveling. He’s got a house in the Delaware beach town of Rehoboth where he spends many weekends. And he talked effusively about a recent North Sea cruise he took. 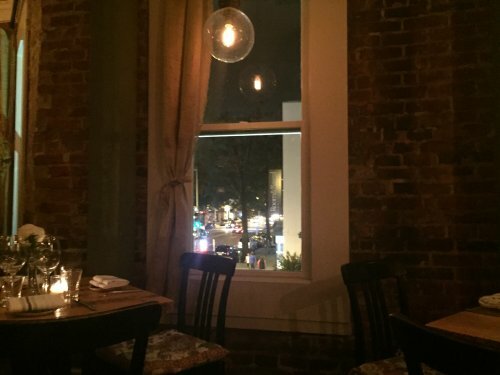 But he said he likes to dine out often, and so I wondered whether he has a favorite place in DC. He favored a French restaurant (now closed) called La Fourchette, praising its menu for evolving with the seasons. “That kept it fresh and exciting,” he said. Yet his absolute favorite is a restaurant called Eden in Rehoboth Beach, in particular a lobster avocado crab meat tower it makes. Although his favorite restaurant is on the beach, he still loves life in DC.